What do you get when you bring together 6,800 wineries, from over 60 countries, with 70,000 visiting wine professionals? Prowein – the world’s largest International wine fair. Every year, a team from Bishop’s Cellar descends on Dusseldorf, Germany for 3 action-packed days of supplier meetings and wine tastings as we search for new and exciting wines for our customers in Nova Scotia. We aim to find at least 200-250 new wines every year to grace the shelves of our retail shop and fill restaurant wine lists around the province. Right now, we’re ordering wine that will arrive in our warehouse in mid to late summer, at the earliest. Long lead times for orders requires that our team look 6-12 months into the future to develop an extensive list of potential wines so we can continually fill our wine order pipeline. To put it into perspective, some of the wines tasted at this year’s show won’t make it to Nova Scotia until Summer 2020! Large international wine shows like Prowein are an efficient way to connect with new producers, without the expense of travelling to each individual wine region. In a single afternoon, we can easily move from tasting mineral, terroir-driven Sauvignon Blanc from France’s Loire Valley to a juicy, robust Cabernet Sauvignon from California’s Napa region. Talk about efficiency! In addition to meeting booths and winery stands, ProWein also has several self-led tasting areas that allow wine professionals to quickly taste through a number of wines and, if interested, use the information cards for each wine to visit the winery at their respective stands to follow up. This year, we spent a little bit of extra time at the Provence Rosé booth looking for what could become your next favourite rosé. Due to the wine show’s sheer size (17 halls each the equivalent of an Olympic-sized soccer stadium!) Bishop’s Cellar sends 4 team members to divide and conquer the expansive trade show. A typical morning could see Kathryn and Jason scouring the Bio/Organic Hall to source interesting new finds from small producers, while Caroline and I meet with one of our larger Argentinian producers to find selections that could fit in this year’s Feed Nova Scotia Case of Compassion campaign. This approach allows us to cover as much ground as possible in the short 3 day show. While ProWein is great opportunity to seek out new producers and spot upcoming industry trends, we also look forward to connecting with long-time suppliers and friends from around the globe. Our industry is centred on amazing products, but it is really the incredible people who make so much of what we do possible. Nova Scotia isn’t typically the first stop for many of our international suppliers and we can often get overlooked on travel plans to Canada. ProWein allows us to manage our supplier relationships better. This year, we managed to connect with over 40 existing suppliers: everything from a quick stop at a supplier’s booth to taste the new vintage to a sit-down meeting to discuss plans for the upcoming year. Our team had a wonderful experience at this year’s show and we can’t wait for you all to try the exciting new wines we have found. Until next year – PROST! In the years since joining the Bishop’s Cellar team, Matt has worked in almost every side of the business operations. 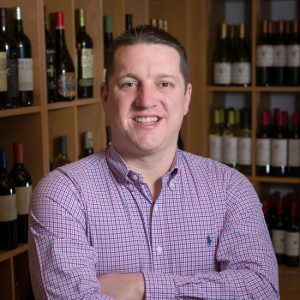 He started working with the company to create a wine club which led to a complete overhaul of the Point of Sale system, which then led to his involvement in the operations of the entire company. He’s now in charge of overseeing Bishop’s Cellar day-to-day while working at our vision for the future, from the inside out. An entrepreneur and idea person at heart, Matt’s love of wine has developed over time—he’s enjoyed learning and travelling so much that he’s now an avid enthusiast and collector. Outside the office he enjoys playing golf and darts, plus he tells us that he “plays a mean game of washers”. He’s also a 21Inc Emerging Leader (Top 50 under 35) and Awesome Foundation Trustee—helping Halifax be more AWESOME.